A Coburg staple since 1847. Yep, more than a decade before Oregon was a state, there was Coburg (a real diamond in the rough), and there were meat-eaters... but those pioneers never imagined anything quite this amazing. Italians like meat too. You'll see. 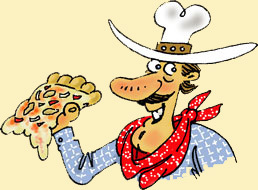 The original Pettine-gourmet: Grandpa Mikele’s famous family-adaptation of the most sought after pizza in the world. 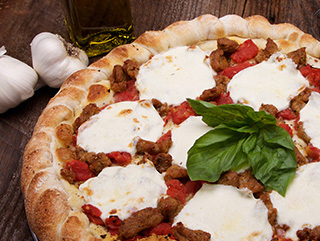 Plum tomatoes, tons of fresh mozzarella & basil with the flavors of olive oil, Italian herbs, savory minced garlic & spicy Italian sausage. Only back a generation or two were the Bassanis who had a love of chefing from the farm & garden. 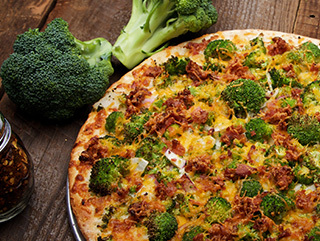 Enter the Bassani Broccoli Bacon & Cheddar Pie: simple garden ingredients like a mountain of fresh broccoli, & along with onions we add wholesomeness with olive oil, bacon, mozzarella & cheddar with a dash of red pepper. 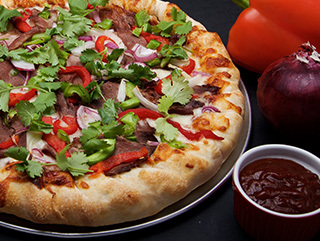 Big taste from the big state of Texas — our tongue tempting special BBQ sauce, smoky provolone, lean steak, onions, green peppers, roasted red peppers & finished with flavorful cilantro. 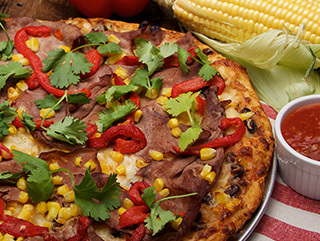 No need to go south of the border for spicy Tex-Mex flavor… Our own zippy chipotle sauce, our great cheeses, tender slices of succulent steak, seasoned black beans, roasted red peppers, sweet corn, cilantro & spicy chipotle salsa. 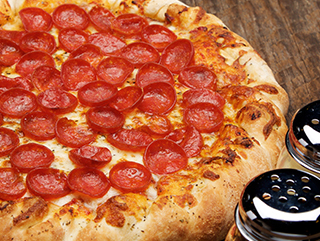 That great, all-American flag-waving taste is now on your favorite pizza! 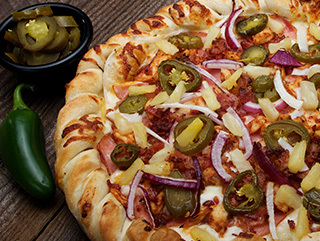 A ton of our country-smoked bacon, spread out over a tasty blend of provolone & mozzarella. 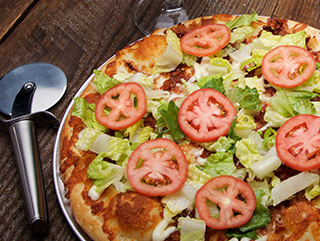 Then we add lettuce, tomatoes & a kiss of mayo… It might be your all-time favorite all-American-pie. 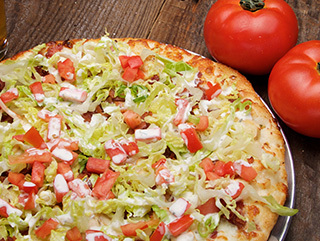 The very cool pause that refreshes: Canadian bacon, chicken breast & real country bacon catch the wave with our outstanding provolone & mozzarella, with lettuce, tomato & ranch cresting after the heat wave. Bring it! Straight from the south-side, you’ll almost taste the accent. 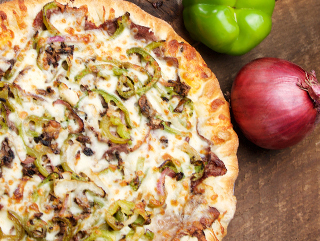 Juicy cuts of tender & succulent steak, & a sensational gathering of sautéed mushrooms, onions & green peppers, topped with mozzarella, cheddar & smoky provolone. In New Bedford, Mass., where Nana grew up, the Italian & Portuguese immigrants shared family recipes & intermixed the best of both Italian & Portuguese tastes. 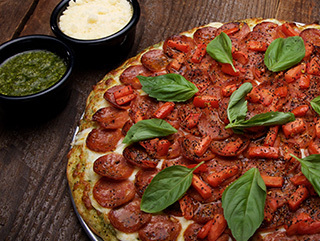 Here’s one of our favorites: Portuguese linguiça, pesto, parmesan, ricotta, mozzarella, fresh tomatoes & basil. Coburg’s namesake. 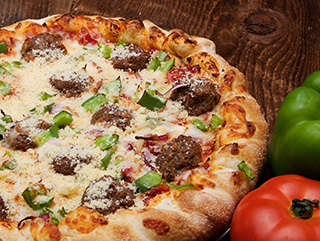 A big classic combo hit: salami, pepperoni, beef, Italian sausage, mushrooms, black olives & extra cheese on homestyle marinara. 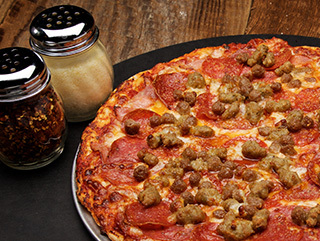 Our spicy red sauce with our spicy Italian sausage & spicy capicola ham. Then we add the mozzarella, then fontina, then the parmesan, then the fresh basil for a splash of cool amidst the heat. 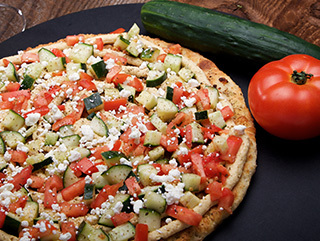 An exclusive available only at The Company, ready to peak your taste bud’s interest. 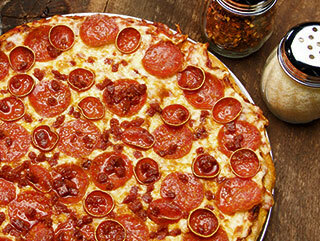 A mountainous horizon of three-kinds of pepperoni: our new sweet & spicy, house-smoked, & traditional pepperonis erupting upon hills & valleys of extra mozzarella. You don’t have to go to the wilderness to find faith, hope & charity. This is the pie that Mikele always wanted to make, named after his dad & nephews aplenty. We take our homestyle red sauce, top it with mozzarella & huge portions of capicola, mortadella, salami & smoked pepperoni. 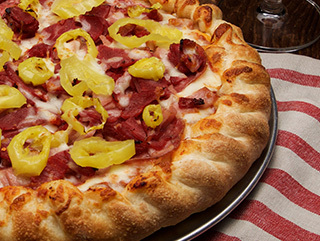 Load it up & finish it with tangy banana peppers. 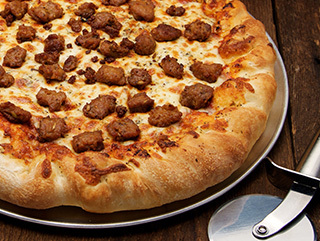 The Vito, the original Italian meat-o. 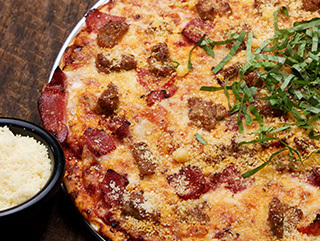 A big meat pizza for the ravenous carnivore in you: mounds of Canadian bacon, Italian salami, pepperoni, sausage & beef and our three great cheeses. Grrrrrr… for bigger zip try our Italian meato sensation, the Vito! 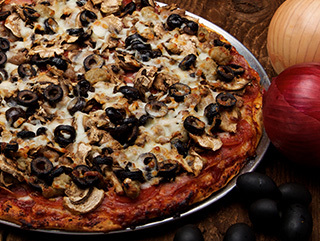 The end of boring pizza with America’s 4-favorite pizza toppings, Company-style. 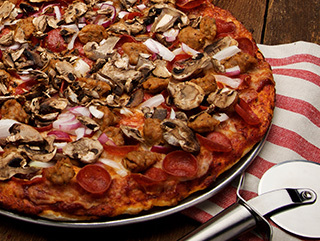 Our flavorful home-style red sauce, wholemilk mozzarella, our gourmet smoked pepperoni & spicy Italian sausage, with mushrooms & onions. 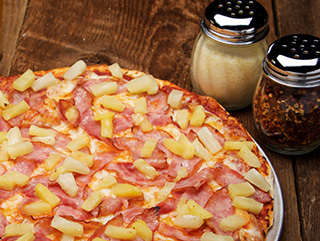 The best Canadian bacon & pineapple ever, with our great cheeses & home-style sauce! You’ll never have to leave Coburg-Island again. Especial from La Compañía from the Mission at Carmen Serdan. Our special black frijoles & salsa, spicy beef, onions & cheese. 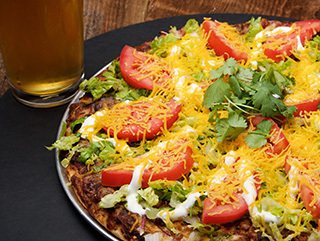 The fiesta continues outside the oven with lettuce, tomato, queso cheddar, sour cream & cilantro. Fantástico!